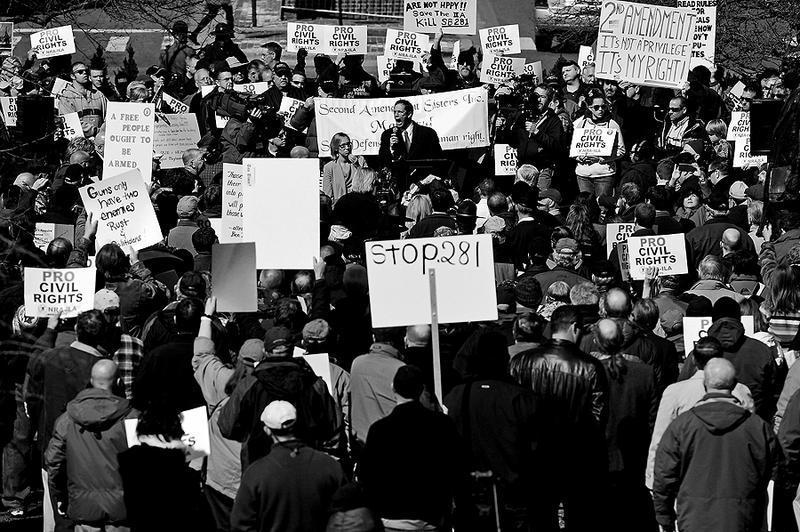 "Maryland State Delegate Don Dwyer, Jr., speaks to other Second Amendment supporters as they rally against stricter gun control laws at the Maryland State House on March 5, 2013 in Annapolis, Maryland. If the Maryland Firearm Safety Act legislation bill is passed, it would require a license to purchase a handgun, ban the sale of assault style rifles and limit magazine size, among other provisions." Following the advocates for stricter gun laws rally outside of the Maryland State House in Annapolis, Md., I was sent back for the stance a couple days later. The assignment was exactly like the last - to document a gun-bill related rally. While their message was polar opposite of the last gathering (otherwise known as a Second Amendment right rally) it was almost identical in terms of visuals. Both sides had signs, speakers and were in the same gathering area outside the State House. I am not taking sides, but in terms of photographs, this group was visually passionate about their view point on firearms. In an attempt to not be redundant from the previous assignment, I removed myself from the large group to get more of an overall. To repeat my last post, it will be interesting to see what the outcome of this bill is. 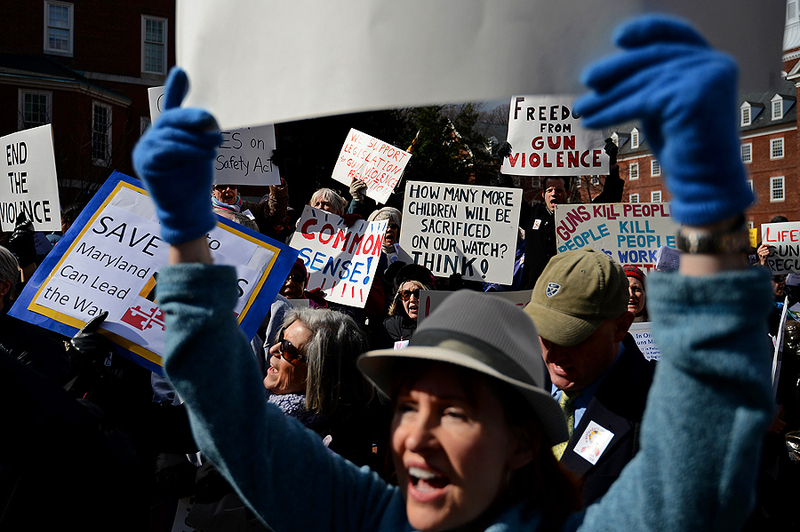 "Advocates of stricter gun control laws rally at the Maryland State House on March 1, 2013 in Annapolis, Maryland. Earlier this week, the Maryland Senate passed a gun control bill, which if passed in the House of Delegates, would require a license to purchase a handgun, ban the sale of assault style rifles and limit magazine size, among other provisions." Last week, I was sent to Annapolis, Md., to cover a rally outside the Maryland State House. The assignment was to document advocates of stricter gun control laws rallying with the Maryland Governor and others, as firearms have recently become a highly debated topic and focal point for both sides of the second amendment. In Maryland, this topic is anything but silent in the news. The Maryland Senate passed a gun control bill, which if passed in the House of Delegates, would require a license to purchase a handgun, ban the sale of assault style rifles and limit magazine size, among other provisions. From past assignments, it's always obvious that both sides are passionate about their stance. One thing I try not to photograph is signs when on these particular types of assignments, mostly in an attempt to stay unbiased. Also, signs sometimes display pictures or words not suitable for publication. However, this event it unavailable. Nearly every advocate carried a sign and there weren't many moments aside from governement officials speaking, chanting that provided visuals otherwise. Nonetheless, this above image I thought told the story of the morning. It will be interesting to see how the House votes on this in coming days, weeks.